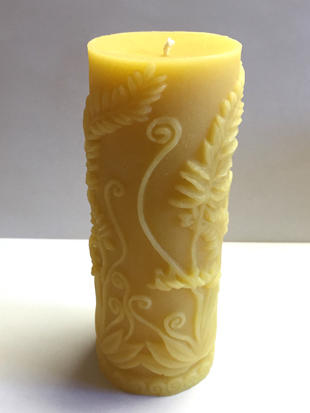 Our beautiful Rustic Fern Candle is 7 1/8" X 2 1/2" and is made of Pure Beeswax. It burns cleaner than other candles and lasts much longer. Tests have given us approximately 102 hours of beautiful burn time, with the design being illuminated from the inside.